This isn't in my wheelhouse, but figured I would throw a curve-ball at you. 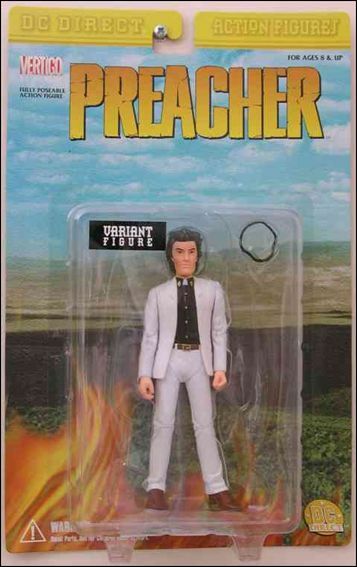 A few years back DC Direct released a line of Preacher based action figures. 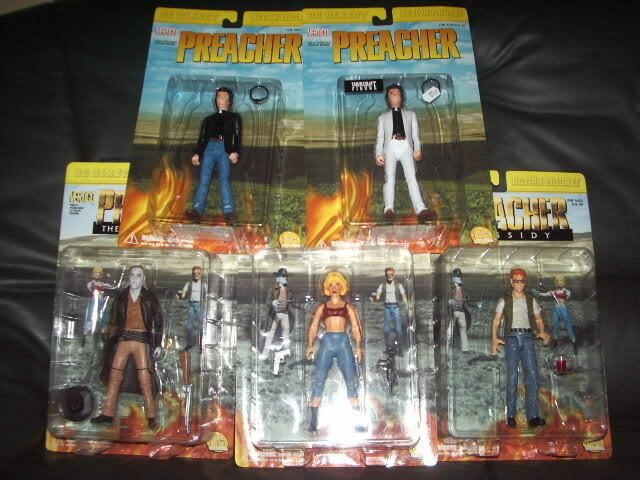 The set featured 5 different figures including Jesse Custer, Tulip, The Saints Killer, Cassidy and………………………….a variant figure featuring Jesse in a white jacket. The white jacket “variant” is indeed a variant and the blister has a variant sticker on the box. As some of you already are aware action figures and comics go hand in hand. There are some very expensive Walking Dead figures right now. These are no doubt the 1st set of Preacher figures, and the odds of them being heavily produced are slim and none. If the series catches fire like some of us are expecting, then these figures will go through the roof in value. The torch bearer being the the “White Coat Jesse” It's already been selling in excess of $75 and most of the public isn't aware of it yet. You can still find these online at a few places, but I suspect they won't be there much longer : ). There is a good chance of making some money on these if you can find them before the series debuts.